If we’re going to rate Apple’s iOS 6 announcements last week for their potential impact on the lives of consumers, I doubt many would put Passbook at the top of their list. Much more focus has been put on the switch from Google Maps, and the changes to Siri, both of which are indeed interesting topics. 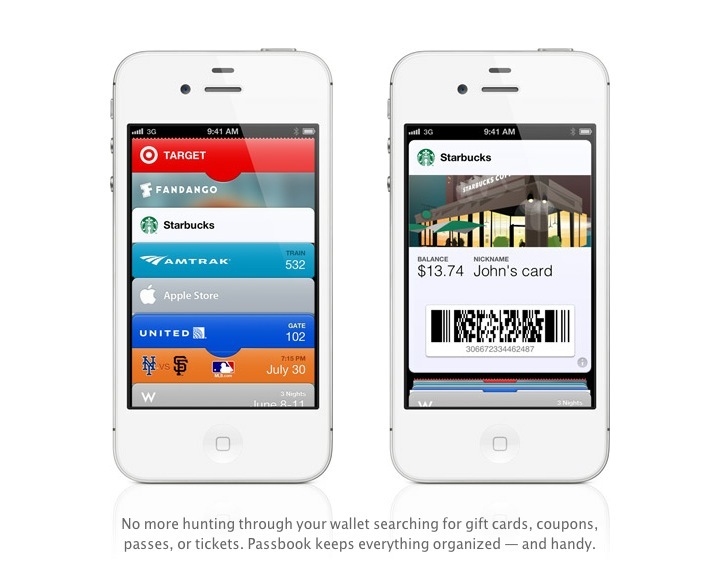 But Passbook is one of those announcements that is simply more than the sum of its parts. There is a lot of meat in this seemingly one-dimensional repository for scannable barcodes. 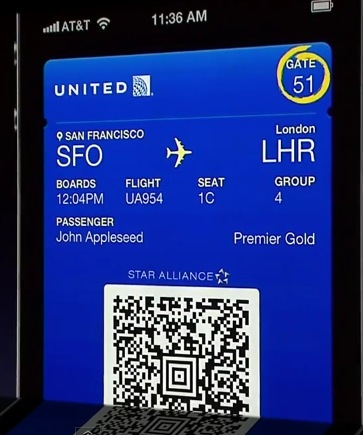 Passbook, as Apple introduced it last week, is an app that collects codes issued by companies in the form of boarding passes, gift cards, movie tickets, coupons and more. Apple bills it as a simple solution to the problem of searching for individual redemption codes in your email inbox or inside individual apps. This is, in and of itself, a pretty cool deal, especially for those who travel quite a bit. The way it works is simple. The passes are issued by companies directly to customers via email or apps or any other avenue that they choose and are added to a user’s Passbook automatically, with no other standalone app required. The repository can take a variety of cards including ones designed from a series of templates Apple has created. Custom designs are also supported, making anything that takes the form of a ‘pass’ or ‘card’ theoretically insertable into Passbook. The redemption happens at the customer’s shop or location, with no communication to Apple. Passbook is provided as a passive location and any communication takes place between the retailer or company and the consumer themselves, that’s it. The cards can be updated with new information if, say, a seat assignment has been changed or some of the balance on a gift card has been used up. They can also have bits of information attached to them that lets them be triggered based on the location of the user. Visit a movie theater where you have a ticket in Passbook and the ticket pops up on the lock screen, letting you open it directly. The same might go for approaching a boarding gate. So far, so good. Apple has taken a complex thing, the collation of the various redeemable bits of info we need while traveling or shopping and has simplified the process greatly. This is something that they excel at and it shows with the Passbook system, which is exceedingly simple. These kinds of scannable cards have existed in various forms for a while now. As has the digital delivery of things like tickets and boarding passes. But Apple is in a unique position to tip the scales for those businesses that didn’t implement these types of passes before. By providing a beautiful experience for the user, and collating all of those passes in one place, Apple is doing its classically great job of solving a problem through the judicious use of simplicity. Think back to your last trip out of town anywhere. Now count the amount of times you searched through your inbox trying to find the various codes and confirmation numbers for hotels, planes, trains and automobile…rentals. I did this for my recent trip to San Francisco and came up with 15 easily, and that’s without edge cases like the WWDC badge and restaurant reservations. Even day-to-day I would suppose that someone who lived in an urbanized city could come up with 2-3 just for transportation. The power of having all of these cards accessible on one place can’t be underestimated. We spoke to Garrett Gee of Scan, a company that has been simplifying and refining the QR experience, about Passbook and he said that Apple’s entry into the market was a positive one. In their work on the QR code, Gee and the Scan team has done a lot to refine the ‘redemption loop’, the cycle that starts with the reception of the code and ends with the final post-scan action. Apple will have to grease the chute as much as possible in order to make the distribution and redemption of these passes as easy as the collection of them is. Which is where we encounter our first snag with Passbook. You can’t redeem these passes with just any old barcode scanner. 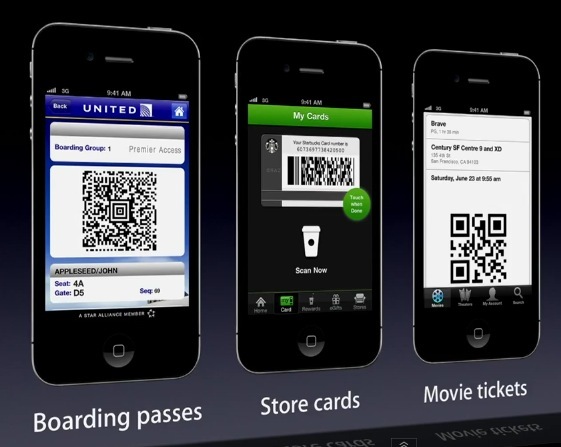 The passes within Passbook are triggered with the kinds of barcodes that you would associate with a ‘QR’ code, although that name was carefully left unmentioned by Apple during the presentation or in its promotional materials. We confirmed this by speaking to Gee, who says that the types of codes that are being offered by Apple will require camera-based scanners, rather than the traditional laser-based types that many stores use to read the one-dimensional ‘stripe-type’ barcodes. This means that you’ll be having stores enter a string of characters to redeem the cards unless they upgrade to the expensive camera-based scanners, or if an enterprising company like Scan doesn’t come up with a way to allow them to redeem Passbook passes. Or, perhaps Apple will launch an app to allow all retailers to redeem these types of passes, perhaps a ‘redemption mode’ in Passbook itself or an API that can be implemented easily in their own apps on iDevices. Larger companies, like United Airlines, Target and other retailers have already invested millions of dollars in handheld and kiosk-type scanners that can read these types of codes. Entering a string of numbers will work, but scanning is the ideal way to make these codes fly. Unless the problem with smaller retailers gets solved, there is a limit to the breadth of adoption of these kinds of passes. But, at least for now, hopes are high among companies looking to implement this. I spoke to folks at the show last week who were involved in offering various types of push services and they said that clients were contacting them before the keynote even let out, wanting to know how soon they could start offering a Passbook solution. There is a desire for this kind of thing and Apple appears to have the bones done right. And the potential for success doesn’t stop at redeeming movie tickets. What Apple is dealing with here is building trust. Initially, that trust will result in people feeling comfortable with their gift cards in Passbook, but the potential payoff is far larger. 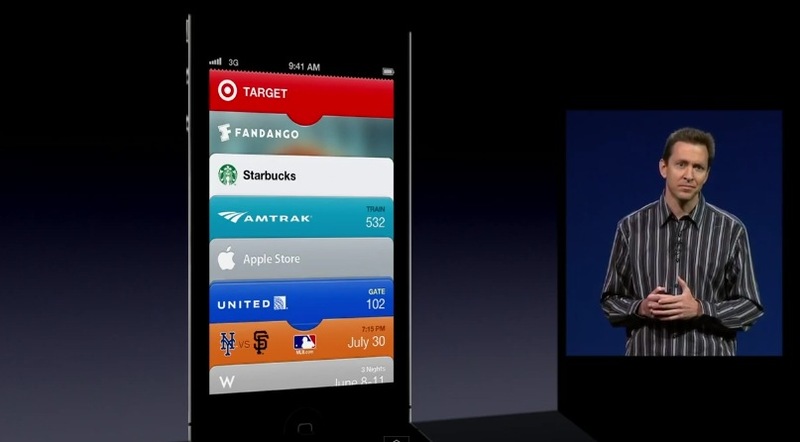 Passbook carries with it the potential to create a world where you use an Apple ID to buy anything and everything. In order to be successful in payments, you have to build trust. People have to trust you with their private information, with their bus tickets, with their airline passes, with their gift cards and, eventually, with their wallets. There is a lot to be said for this angle, as there are few companies out there who have taken the time to build user trust with payments in the way that Apple has. Apple CEO Tim Cook says that the company has 400 million iTunes accounts with credit cards attached in its databases. That’s an enormous potential pool of payments users, but you still have to teach those users that using their phone to scan these passes is safe, first and foremost. As Apple leads them through the educational process of collecting and redeeming these passes, it builds a chain of trust that it can use if it chooses to expand into payments with either Passbook or a new app for payments. And don’t think that these types of QR-like codes aren’t suited to secure payments. Because the code is digital, you can change it on the fly, generating a new one each time, making screenshots useless. Or you can leave the code itself static and use the URL it points to as a security gate in between the payment transaction and the scan itself. Say Apple hooks up an iPayment card of some sort to your iTunes account and tucks it into Passbook. Perhaps you enter a passcode to get into Passbook, then type in your Apple ID and it generates a 2D code, then you scan it, and the code expires after a billing has been made to it. Or the URL can require a passcode, generating a new link for each transaction. This would allow Apple to offer payments via your Apple ID, without exposing any credit card numbers or sensitive information, all from your phone. It would still offer up some logistical issues, however. Apple certainly wouldn’t want to offer its service free of charge. This would mean a fee charged per transaction, which is the norm. This would be on top of the one already charged by credit cards and other providers. Making an Apple payment more expensive for retailers than the 2% charged by Mastercard or 3% charged by American Express. Unless, and this comes back to trust, Apple required a direct connection to your bank account to enable your Apple ID for direct payments. This would be a hard sell, but it would be making that pitch to people who have already trusted credit cards to it for some time, so it’s not as outlandish as you think. The fact of the matter is that people, by and large, are not ready for mobile payments. I’m probably not even ready and I’m an early adopter. This is why other technologies like NFC haven’t taken off for Google or other mobile makers that have tried to make it happen. There is a trust threshold that hasn’t yet been breached by any major company, although services like Square are making headway. 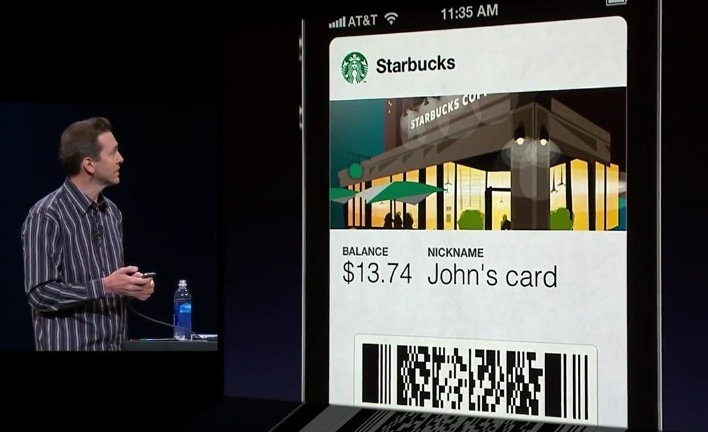 Apple is uniquely positioned to take its current cachet with regards to credit cards and build on that through the redemption of passes and gift cards through Passbook. Once it has this kind of trust, it can use NFC hardware in a future phone to further expand its payment options. The beauty of it is that this kind of system doesn’t even preclude companies like Square taking advantage of Passbook. Although it has its own app, it could just as easily offer a ‘Square’ card inside Passbook or allow stores to redeem codes from a Passbook pass. The same goes for a banking company like Simple which could provide temporarily authorized payments via Passbook, once it became ‘payment ready’. Passbook isn’t a payment solution, it’s a trust solution. The burden is now on Apple to make these passes as easy to issue and redeem as possible, spurring their adoption. Every scan of a pass from Passbook will build trust and pave the way for them to unleash hundreds of millions of customers primed to pay with Apple.